climatic upheavals and consequences of the greenhouse effect: disturbing coincidences. In rejecting the atmosphere the pollutants given above, the man does not just destroy himself, it would upset the natural balance of regions, then even larger scale, of the whole Earth. The main consequence is the greenhouse effect that results in a very sharp increase, on a geological scale, temperatures. But given the novelty of the phenomenon of greenhouse gases, scientists and meteorologist can only make more or less plausible assumptions about the consequences of the greenhouse effect. 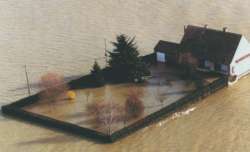 - The floods (and droughts): frequent in France. More 600 deaths in Algeria in November 2001. -fontes ice: at the current rate of rising temperatures, 95% of the mass of the Alpine glaciers will have melted by 2100 (92% of the mass of Mount Kenya glacier has disappeared). For the first time (Summer 2000) there was liquid water at the North Pole. This list is not exhaustive and certainnes consequences of the greenhouse effect are still unknown. Nevertheless the human and financial costs are enormous. Estimated cost of pollution in CO2. The Kyoto conference considered the preventive cost of a tonne of CO2 between $ 20 and 40 $. This cost was estimated in anticipation of potential damage occasioned by the CO2. In France, preventive and cost virtual rises, nothing about transport, 1.7 Billion francs / year. As an example, the December storm 1999 "cost" in France: 88 dead and 150 billion frs. How to counter this ecological suicide? Because pollution will not touch, as some very mediated diseases, a part of the population, but all mankind, no one will be spared even if the poorest populations will be most affected (as we have seen with murderous flooding in Honduras and Algeria).